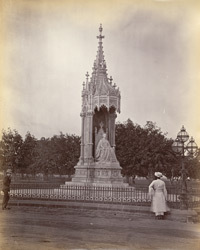 bl.uk > Online Gallery Home	> Online exhibitions	> Asia, Pacific and Africa Collections	> Queen Victoria Statue, Bombay. Photograph of the statue of Queen Victoria, taken by an unknown photographer in the 1870s in Bombay (Mumbai), Maharashtra, from an album of 40 prints mostly dating from the 1860s. Bombay, the capital of Maharashtra and one of India's major industrial centres and a busy port, was originally the site of seven islands on the west coast, sparsely populated by Koli fisherfolk. Bombay was by the 14th century controlled by the Gujarat Sultanate who ceded it to the Portuguese in the 16th century. In 1661 it passed to the English as part of the dowry brought to Charles II by the Portuguese princess Catherine of Braganza. By the 19th century Bombay was a prosperous centre for maritime trade. Matthew Noble's statue of Queen Victoria, seated beneath an elaborate gothic canopy, was unveiled in 1872. The statue, separated from its canopy in the 20th century, now stands in the grounds of the Dr Bhau Daji Lad Museum (formerly the Victoria and Albert Museum). The marble canopy was purchased by an industrialist and stands empty in his garden.